Proposals for Development in the Mathematics Division of an Automatic Computing Engine (ACE). Lecture to the London Mathematical Society on 20 February 1947. Intelligent Machinery. Checking a Large Routine. Computing Machinery and Intelligence. Digital Computers Applied To Games. Solvable and Unsolvable Problems. 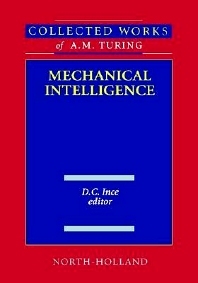 The collected works of Turing, including a substantial amount of unpublished material, will comprise four volumes: Mechanical Intelligence, Pure Mathematics, Morphogenesis and Mathematical Logic. Alan Mathison Turing (1912-1954) was a brilliant man who made major contributions in several areas of science. Today his name is mentioned frequently in philosophical discussions about the nature of Artificial Intelligence. Actually, he was a pioneer researcher in computer architecture and software engineering; his work in pure mathematics and mathematical logic extended considerably further and his last work, on morphogenesis in plants, is also acknowledged as being of the greatest originality and of permanent importance. He was one of the leading figures in Twentieth-century science, a fact which would have been known to the general public sooner but for the British Official Secrets Act, which prevented discussion of his wartime work. What is maybe surprising about these papers is that although they were written decades ago, they address major issues which concern researchers today.